PJTSAU PG, Ph.D Entrance Exam Merit list Results, Admissions counselling Schedule 2018: PJTSAU PG, Ph.D Entrance Exam Hall tickets, Exam date, Results, PJTSAU PG Entrance test Merit list Results for PG PhD,MSc,MBA,MTech admissions 2018/ Merit List of Candidates Qualified in PG - Entrance Test - 2018-19 for M.Sc. (Ag.) / M.Tech (Ag. Engg.) / M.B.A (ABM) / M.Sc. (H.Sc.) Level Courses offered in the Academic Year, 2018-18/ M.Sc (Ag), M. Tech. (Agril. Engg. ), MBA (Agribusiness Management) and M.Sc. (Home Science) Merit list 2018-18/ Admissions counselling Schedule 2018, PG Admission Schedule 2018-18,PhD Admission Schedule 2018-18, PG PhD Admission Schedule 2018-18: The Professor Jayashankar Telangana State Agricultural University (formerly part of Acharya N.G. Ranga Agricultural University) is responsible for education, research and extension in Agriculture and allied fields in the state of Telangana. The University imparts instruction leading to the Doctoral degree courses in Agriculture, Home Science and Agricultural Engineering & Technology and allied fields at its constituent Colleges at Rajendra¬nagar and Hyderabad. 1. The admission shall be on the basis of offline counseling. Candidate must attend the counseling. 2. The admission will be done only on the basis of ICAR entrance examination in the particular major subject / group and based on the counseling. 3. Attending counseling, does not guarantee seat, it will be confirmed as per seat availability in the particular major subject group / sub group. 4. The candidates who appear for ICAR entrance test in a major subject group shall not be permitted to interchange to any other major subject group. The identified subject groups shall be considered for admission only. 5. Seat allotment will be done on the basis of merit, category, area, and rule of reservation and seat matrix. 6. Selected candidates shall submit all original certificates including e-admit card and ICAR score card and shall pay the entire fee for confirming the allotted seat at the respective colleges. 7. In case of SC/ST and BC candidates, original social status certificates issued by competent authorities shall produce during counseling. 8. Medical certificate in case of physically challenged (PC) candidates, issued by competent authority shall produce during counseling. 9. The admission shall be liable for cancellation without notice at any stage during the study of the students, if it is found that this admission is in any way repugnant to the rules / regulations or invalid by reason of incorrect or false information furnished by the applicants or their parents / guardians at the time of admission. Merit candidates list for PG Courses counselling on 20.10.2018 at 11.00AM for the year 2018-19. for the year 2018-19. The candidates advised to attend the counseling with all original certificates and entire fee along with ICAR score card and E-admit card. 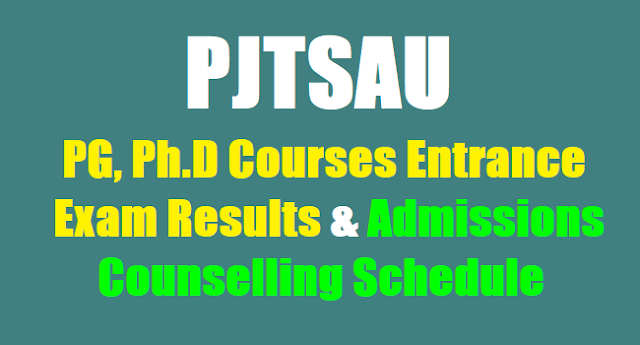 Merit candidates list for Ph.D Courses counselling on 19.10.2018 at 11.00AM for the year 2018-19. The candidates advised to attend the counseling with all original certificates and entire fee along with ICAR score card and E-admit card. Master of Science or an equivalent examination in Agri¬culture or Home Science, as the case may be, in the concerned field of specialisation at least with 50% marks in the aggregate under traditional system of examination or an OGPA of 3.25 or above in 4.00 point scale or OGPA of 7.50 or above in 10.00 point scale in grade point system. In the case of SC and ST candidates, a pass in the Degree of Master of Science in Agriculture or Home Science as the case may be under traditional system or OGPA of 3.00 out of 4.00 or 7.00 out of 10.00 under Grade Point system is sufficient. The Basic Degree i.e., B.Sc.(Ag. )/ B.Sc. (Home Science)/ B.H.Sc. (Rural) / B.Tech. (Ag. Engg. & Tech.) of 4 years duration from ANGR Agricultural University / PJTSAU or an institution accredited by ICAR / approved by ANGRAU / PJTSAU is essential. Note: Subject to submission of final OGPA of respective degree. Merit List Results of Candidates Qualified in PJTSAU PG - Entrance Test - 2018-18 for M.Sc. (Ag.) / M.Tech (Ag. Engg.) / M.B.A (ABM) / M.Sc. (H.Sc.) Level Courses offered in the Academic Year, 2018-18. OR Qualified Candidates list in in PJTSAU PG - Entrance Test - 2018-18 for M.Sc. (Ag.) / M.Tech (Ag. Engg.) / M.B.A (ABM) / M.Sc. (H.Sc.) Level Courses offered in the Academic Year, 2018-18.